Chicago, IL, 2018-Aug-24 — /Travel PR News/ — The Chicago Department of Aviation (CDA) today (08/23/2018) welcomed the return of a herd of grazing animals to manage natural vegetation at one of the world’s busiest airports. 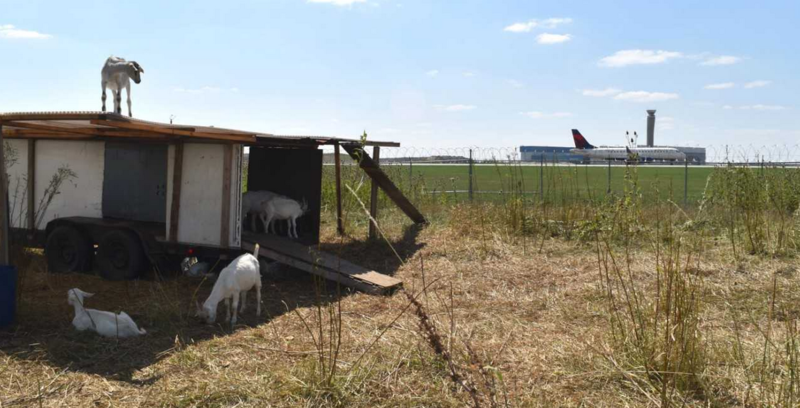 The grazing herd—comprised of a mix of 30 goats, sheep, and a donkey named Jackson—will be on hand at O’Hare International Airport for the next several weeks to manage vegetation, including tall grasses, on 16 acres of land on the west side of the airfield. Reduces natural vegetation harboring wildlife near runways, which could impact aircraft during takeoff. Eliminates air pollution otherwise caused by a lawnmower. Delivers a sustainable means for maintaining essential green space and safe conditions near the airfield. The grazing herd, also known as a sustainable vegetation management initiative, at O’Hare International Airport first began in 2013, and is one of many sustainable practices spearheaded by the CDA in recent years—from roof top green space to compostable cutlery for concessions to water bottle refilling stations in the terminals. The CDA’s sustainability programs, including new sustainable infrastructure installed since 2011, align with Mayor Rahm Emanuel’s vision and leadership in making Chicago the most sustainable city in the country. These investments have reduced electricity and natural gas usage to make Chicago’s busy aviation system more environmentally-friendly even as passenger volumes have risen. The grazing herd, made possible through consultation with the U.S. Department of Agriculture (USDA), will be on hand through the fall or until the vegetation is fully cleared. This entry was posted in Airports, Travel, Travel & Environment, Travel Services, Travelers and tagged animals, CDA, O'Hare International Airport, Rahm Emanuel. Bookmark the permalink.